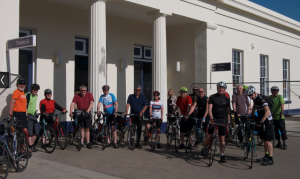 This was the first time Newham Cyclists ride programme had included this lovely ride around the north Kent coast, also known as the Viking way. It was the warmest day of the year so far and this may have encouraged the large turnout, as there were 17 of us leaving Canterbury station, under clear blue skies. The ride started with a sharp hill up past Kent university where we joined the Crab and Winkle way, a disused rail line to Whitstable. The route led us through beautiful countryside, woods and into Whitstable via the back streets to Whitstable station. As we arrived at the coast we had to negotiate some traffic as we went through the town along the coast road to Herne Bay. The good weather had brought out the crowds and all the seaside towns along the way were full of people enjoying the sun, while the sea was completely calm and looked more like the Mediterranean. From Herne Bay we climbed up towards Reculver, where we had our first puncture, it was a picturesque spot and timely rest. The promenade merged into the open coastal path with lots of walkers and cyclists, then past mini chalk cliffs and on to Westgate on Sea where we had lunch, some of the group pressed on to Margate aiming for a different lunch stop. We reassembled in Margate, close to the Tate and carried on through the town and up into the road overlooking Palm Bay and Botany Bay, and the Australian weather continued. Broadstairs is a pretty town with endless references to Charles Dickens and long queues for ice cream, it was necessary to walk the bikes through some of the narrow crowded lanes there. At Ramsgate we had to leave the coast and turn in towards the station where we were in good time to catch the fast 16:05 train back to Stratford.